EDMONTON'S flourishing hip-hop scene has just gotten a major boost, with the recent concert announcement for the Edmonton Event Centre. Drake (see his latest video "Over" below), who's one of the most sought-after acts in the world right now, will make his way to our city on Saturday, July 24, as part of his Away From Home Tour. 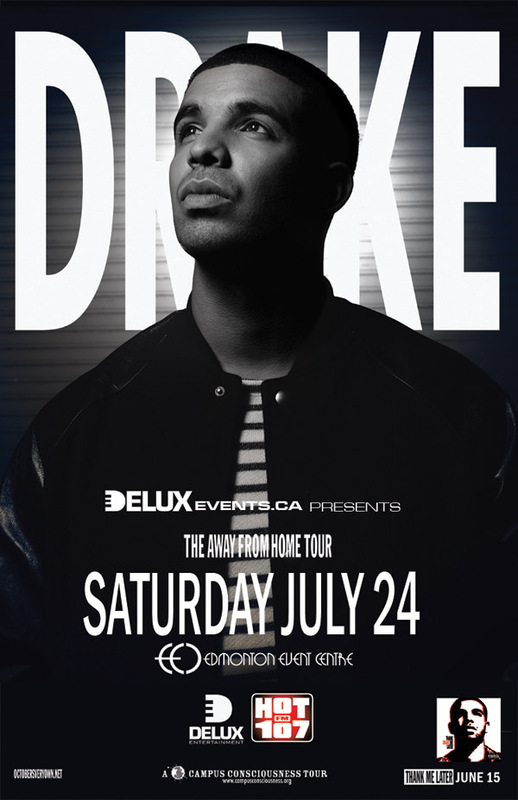 Tickets for the Toronto-born rapper (& actor) go on sale this Friday (May 21). This Sunday (May 23) the EEC will also host a no-minors concert by hip-hop legends Public Enemy, at 8PM. Contact Ticketmaster (780-451-8000) for tickets. There are a limited amount of half-price tickets ($19.99) available for Public Enemy until Friday at 10PM. SPEAKING of hip-hop, the Louise McKinney Riverfront Park (9999 Grierson Hill Road) will welcome thousands of locals this Saturday (May 22) for the third annual 'Hip-Hop in the Park' concert. Mostly local rappers and DJs will perform from noon until about 8PM, including Politic Live, DJ WeezL, Shaw Langley, and Nova Rockafeller. The free event--which wraps up Edmonton's Hip-Hop Appreciation Week--will also include graffiti writing, break dancing, music workshops, and B-boy/B-girl battles. The McKinney Park is in the river valley just south of the Shaw Conference Centre. No dickheads allowed! NO names have been released yet, but recent Olympic gold medalists from Canada's men's and women's hockey teams are expected to take part in the 7th annual Hockey Canada Foundation gala and golf tournament. The charity event will be held on Monday, June 28 at Edmonton's Marriott at River Cree Resort & Casino, and will benefit (mostly) an outdoor skating facility to go up at Telus Field. The Edmonton Petroleum Golf & Country Club and Blackhawk Golf Course will set the stage for the celebrity golf tournament on June 29, and may include the likes of Sidney Crosby and Hayley Wickenheiser. The gala will be emceed by Pierre McGuire and Gord Miller. EDMONTON is well-known for its volunteers and sense of community, and inner city humanitarian organization the Mustard Seed (96 St. & 106A Ave.) is no exception to the love. But there's one thing in particular that they just don't seem to get enough of when it comes to generous donations. Undies! Donating used underwear isn't exactly standard practices for the Mustard Seed, so imagine their delight when a pair of Calgary businessmen (Brent King & Robb Price) (pictured left) drove up to the doors to drop off 3,000 pairs of men's underwear yesterday (May 18). It's part of a 10-city, cross-Canada drive called GotGinch, which will see about 300,000 pairs of gonch donated to various charities by the time they wrap up in Halifax. IT'S 'pay what you can' for Stories About Us: The Movie, playing at Metro Cinema (Citadel Theatre/ 10250-106 St.) on Thursday, May 27 at 7PM. The documentary captures the ups and downs of launching Rising Sun Theatre, local company made up of actors with developmental disabilities that put together an award-winning theatre production called Stories About Us. In 2009 the group won the Telus Award for Courage to Innovate at the Mayor's Celebration of the Arts ceremony. "I EXPECT there will be lines of people all around the mall waiting for the opening of this store," said Limited Brands Inc. president Martin Waters, referring to the upcoming Victoria's Secret store in West Edmonton Mall. The company will premiere four flagship stores in Canada this summer: three in Toronto and one in our city, which will be the only Victoria's Secret in western Canada. The lingerie outlet will be about 16,000 square feet, and will officially open its doors on August 12. YOU only have until this Friday (May 21) to submit your application for a summer marketing internship at Edmonton's beloved CKUA Radio. The 83-year-old station recommends you be as creative as possible in applying, suggesting writing a poem or short story, a song or an essay, or even shooting a short video, telling 'em why you'd be the best candidate for the position. For more information about the 'CKUA Marketing Summer Intern Competition' click here. THE 2010 Rainmaker Music Fest is just around the corner, hitting up St. Albert for two days later this month. Dwight Yoakam will headline the 'Country Night' (Friday, May 28), which also features Adam Gregory, One More Girl, Jo Hikk, and Craig Moritz. The following night (May 29) will be dedicated to rock fans, headlined by Buckcherry and featuring Social Code, The Trews, China White, and Jerry Doucette. You must be at least 18 to attend Rainmaker, and tickets are available through Ticketmaster. JUST a reminder: Disney's Beauty and the Beast is currently playing at the Citadel Theatre (9828-101A Ave./ 780-425-1820), and will continue to until Sunday, May 30. The theatre production features the classic characters and music from the Oscar-winning animated film adaptation, including a 12-piece orchestra and a cast of two dozen performers. "Disney's Beauty and the Beast reminds us that we should never judge anyone by what we see on the surface," says the show's director Bob Baker. Tickets are available at the Citadel's box office. BRAND new mama & Edmonton-born writer Leanne Power has just launched her first children's book You Are Sooooo Beautiful, which teaches children that "true beauty is embracing who you are at your very core." You can purchase the book ($19.99) at Amazon.com or at various Alberta book stores, including Greenwoods' Bookshoppe (7925-104 St.) and Indigo South Edmonton Common (1837-99 St.). 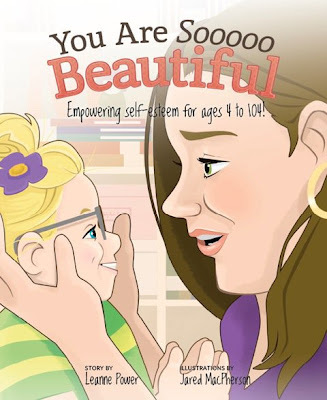 The book will illustrated by locally-based artist Jared MacPherson. THE 29th annual Canadian Country Music Association Awards will be held at Rexall Place on Sunday, September 12. The ceremony will be the focal point of various events throughout the city. So far the Awards show has lined up Canuck stars Terri Clark, Johnny Reid, George Canyon, and Doc Walker. Tickets are currently on sale and cost $35, $70 and $95 at Ticketmaster. I Heart will keep you updated on any new acts booked for the show. The video below is Drake's latest single "Over" (2010).